This document outlines the process of planning and installing the physical Cascade-500 IoT Gateway hardware. It lays out common planning questions to be considered, recommendations from Rigado, and the physical mounting and installation process. Please read through the entire document prior to beginning installation of hardware. Planning is key to the success of any hardware installation. There are many things to consider when installing a wireless system into a space. Key elements for consideration are listed in the sections below. In a typical commercial space you can generally expect a coverage area of about 2,000 sq. ft. per gateway. However, the area of coverage for each gateway is dependent on the layout and construction of the facility where it is installed. A gateway in an open floor plan will have a larger coverage area than a closed floor plan with many walls. Building construction materials also affect coverage: drywall and glass permit more coverage than brick and concrete. Coverage planning should give consideration to brick or concrete walls, as you should not expect to get much penetration through those materials. If you require coverage on both sides of a brick or concrete wall, plan for a gateway on each side. If a higher level of coverage planning precision is required, Rigado suggests using a Wi-Fi site planning tool to simulate coverage. There are multiple planning tools available online, both free and professional. For use in this application the tool should allow for changing the characteristics of the Access Points to match those of the Cascade-500 IoT Gateway (these specs are available from Rigado upon request). Correct placement of gateways is important for getting the desired coverage. Generally, mounting gateways up high and out of reach is recommended, as this improves line of sight while making the units more difficult to tamper with. Special consideration should be given to any metal near the mounting area, such as in support beams or HVAC ducts, as it is not recommended to mount the gateway directly to any large metal surface. Gateways do not need to be visible for operation. 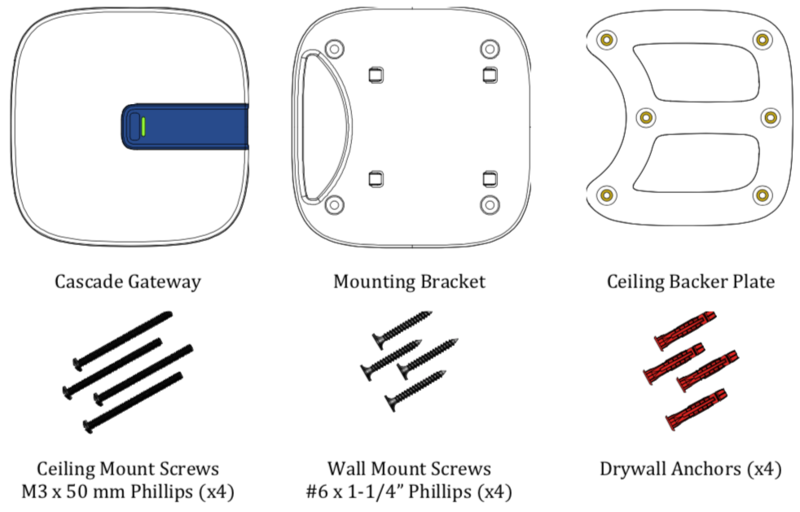 It is common to mount gateways above drop ceilings, to either the wall or a drop from the ceiling. When mounting above drop ceilings or in open office style spaces, it is recommended to mount the gateway below the level of any ceiling HVAC ducts to avoid dead spots. The types of connections required should be taken into consideration when planning a new installation. In order to function, the gateway needs both a power and internet connection. For power, the options are PoE (Power-over-Ethernet) or AC wall power (adapters available upon request). For internet connection, the two options are Wi-Fi or Ethernet. Rigado suggests using PoE-enabled Ethernet for gateway connection. PoE connections allow for both data and power to be provided to the gateway, requiring only one cable for installation. Special consideration needs to be given when choosing to use Wi-Fi, as the gateway is always connected and does not have a physical user interface. Most corporate IT policies require updating passwords after a set number of days, which would break a gateway’s Wi-Fi connection and require manual configuration on each gateway in order to update the password. Power can be delivered through the barrel jack or through PoE. Power through the barrel jack (5.5mm x 2.1mm) should be 4.5 to 5.5VDC (3A max for LTE, 2A otherwise). PoE can be delivered via the Ethernet connector (RJ -45) at 36-57V (IEEE 802.3af). 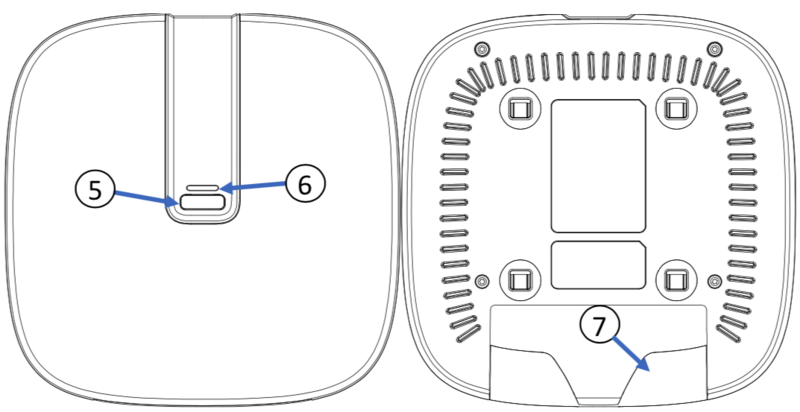 Interface features are described throughout this section, including power and data connectivity, and button and LED location and behavior. The gateway is equipped with a single 10/100 Base-T Ethernet connector. For configurations supporting PoE (802.3af), the gateway will operate when powered by either a PoE switch (endspan) or injector (mid-span). A soft reboot will restart the operating system on the gateway without interrupting power. A hard reboot will shutdown the operating system, cycle the power, and start the operating system again. A USB 2.0 Type-A connector on the gateway board provides access to a High Speed (up to 480Mbps) USB host. The gateway provides a 5.5mm x 2.1mm barrel jack for 5V DC input. Any AC/DC wall adapter used to power the gateway needs to be rated up to 2A. Please note that actual current consumption depends upon the apps deployed on the gateway. A front facing button is located on the face of the gateway. This button is not enabled on the default gateway configuration. A multi-color (red/green/blue) LED located near the user button provides a means of visual indication for the user. For additional information regarding LED behavior, please refer to Gateway Boot Status. The back of the unit has a snap-in cover for improved cable management. This allows for hidden cable routing when the unit is installed on a wall or ceiling. The cable cover is removable. 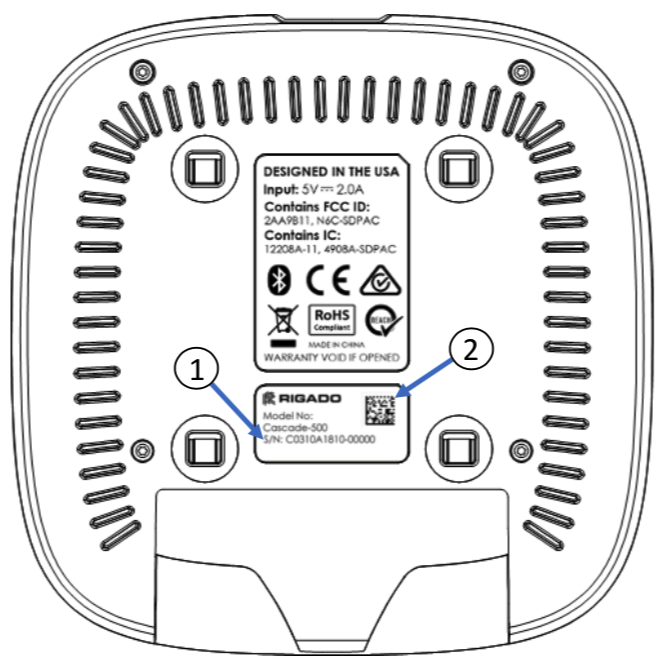 Before the gateway is permanently installed, look at the bottom (mount side) and record the unit Serial Number (1) or scan the 2D barcode (2), as shown below. Rigado recommends mounting the gateway with the tab pointing to the side (mounting bracket installed as shown below). This correctly orients the antennas and maximizes gateway coverage. 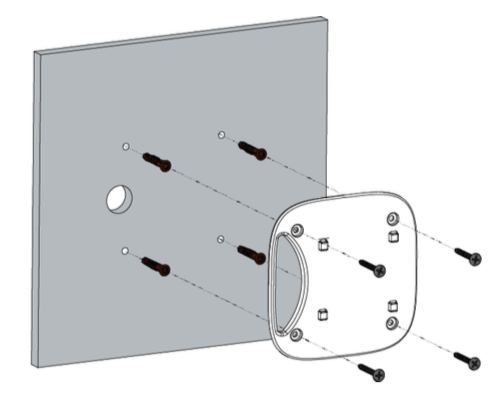 Use the mounting bracket as a template to mark the hole locations on the wall or ceiling. If mounting to the wall, use a 3/16” (5 mm) drill bit. If mounting to a ceiling tile, use a 1/8” (3-4 mm) drill bit.If a hole is needed for any cables, also mark this in the appropriate cable opening space in the mounting bracket. Push the provided drywall anchors into the drilled holes, then place the mounting bracket snugly against the wall. Using a screwdriver, screw the wall mount screws into the drywall anchors. Place one ceiling mount screw through one of the mounting brackets screw holes, and push through the corresponding drilled ceiling hole. Use this screw to guide placement of the ceiling backer plate to the opposite side, then use the screw to screw in this and the remaining ceiling mount screws. 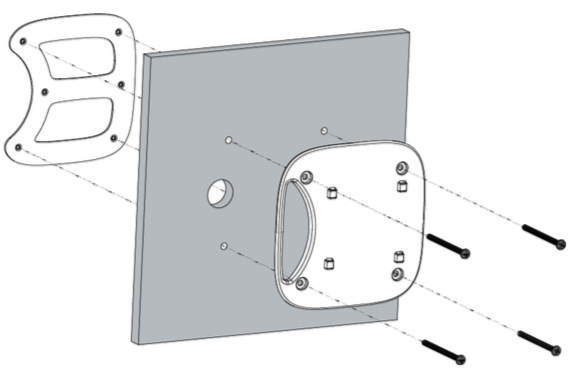 Once the mounting bracket is installed, line up the four hooks of the mounting bracket with the corresponding holes on the back of the Gateway and press the two together. 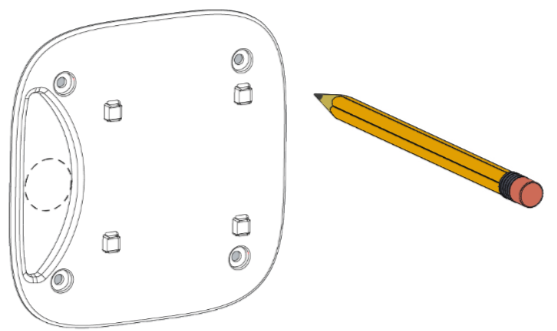 To lock in place, slide the Gateway over towards the cabling hole until it clicks into place.